When we hear the term orchid we typically think of exotics growing far off in the tropics and hard to reach places but we actually have as many as 48 native Maryland species of Orchids. They range from the coastal plains to the piedmont area all the way to the mountain regions in Western Maryland. 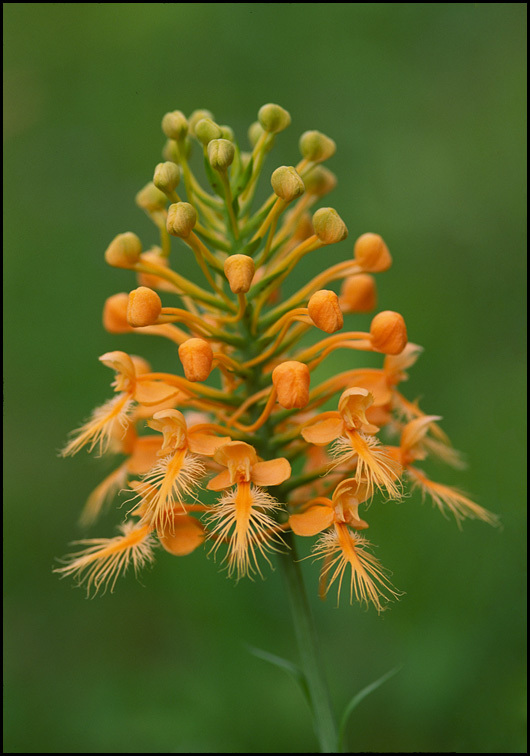 Unlike the tropical orchids that typically dangle from trees as they grow, our Maryland Orchids are terrestrial. They can be found growing in meadows, wetlands, and woodlands across the state. They can be quite showy to tiny and inconspicuous and easily overlooked. The Cape St Claire Garden recently hosted Dr. Gary van Velsir as their guest speaker on Maryland Native Orchids. The stunning slide show showed the many orchids that can be found in Maryland as well as some rare, endangered, or extirpated. There are many reasons for the loss of an orchid species including loss of habitat. Where once a wild population of orchids existed in Glen Burnie at the turn of the 19th century now sits apartments, and building the Capital Beltway wiped out another population. Other threats to native orchids are spread of disease, over collection of a population, pests and decline in the health of the soil. Disturbance of the soil can result in a disruption the symbiotic relationship between the orchids and their soil fungi. This relationship is crucial to their survival through the production of nutrients. Because of the showy nature of many of the orchids they are easily found and poached by unscrupulous collectors. Another factor contributing to their decline is pests and pest management—including spraying to control gypsy moths that can wipe out populations of beneficial insects that pollinate the orchids. All of these factors have contributed to the serious decline of our Maryland orchids. An example is the yellow lady’s slipper Cypripedium parviflorum that was once widely found has all but disappeared in Frederick County due to poaching. The news is not all bad on these declining populations. There are still some success stories, like a newly found population that was thought to be extirpated is newly discovered. Such was the case of the nodding pogonia Triphora trianthophoros that had not been seen in over 50 years but was recently found to at Great Falls in Montgomery County, as well as a significant population discovered on Queen Anne’s County. The yellow fringed orchids Platanthera ciliaris are making a comeback at a managed site in Frederick County despite the less than suitable habitat. These and other stories give us hope that the loss of these Maryland beauties is not irreversible. You could be the one to find a rare or endangered species –sometimes it is just being aware of the surroundings. The Maryland Biodiversity would love for you to report any findings of orchid to them for tracking—you may discover a long ago lost orchid! There are lots of things we can do to help preserve the remaining orchids as well as rejuvenate the failing populations by protecting the areas- forests and wetlands in particular where they grow, –refrain from collecting, picking and digging them up. Please report rare, threatened and endangered populations so the site can be protected. By joining or forming local groups you can help to preserve large tracts of orchid habitat. We as citizens have a responsibility to protect the wild areas near us! Unrelated to orchids, but important this time of year is to help keep our waterways clean by clearing the leaves and other debris that is blocking the storm drains. By keeping the storm water drains clear of trash, leaves, mulch and other debris it will allow the drains to work more efficiently and keep this junk out of our streams, rivers, and even the bay. Please be a good neighbor and steward of the waterways and clear those storm drains!